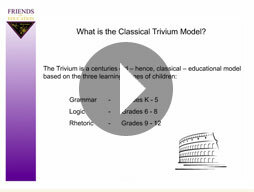 The Classical Trivium describes the learning stages of children as they mature and focuses the educational method in each stage to best develop a knowledgeable, thinking, and articulate student. As its name implies, there are three stages represented in the Trivium: Grammar, Logic, and Rhetoric. While each stage has a primary focus of skill development, all skills are developed during all stages. For example, a second grade student will develop certain skills in logic and rhetoric, while focusing on the factual foundation in each subject. A high school student will continue to acquire extensive factual knowledge in all subjects, while focusing on communicating well. Emphasis is simply placed on different skills during different stages. During the Grammar stage, children are particularly adept at memorization. Young children learn songs, rhymes, and recite facts with relative ease. Because young children are so eager to memorize and they enjoy non-sensical rhymes (e.g. Dr. Seuss), the Trivium challenges them by providing substantial subject matter for them to memorize. Each subject has its own grammar. For example, in science, children memorize facts about nature. In math, children memorize times tables. In Latin, children memorize vocabulary. Throughout each year in the grammar stage, classically educated children learn the factual foundation of each subject, using songs, chants, and rhymes to help them enjoy the learning experience. During the middle school years, children begin to think independently and often develop a propensity for argument. Classical education teaches children in the logic stage to think and analyze critically and to argue well by arranging facts into organized statements and arguments. The study of formal logic helps students understand the fundamentals of a good argument. Practice in making written and oral arguments helps to further develop these skills. Teachers encourage the use of argumentation in each subject. Again, each subject has its own logic. For example, science uses the development and testing of hypothesis; math develops a student's ability to logically orient numbers through the more abstract concepts of algebra and geometry. Rhetoric is the art of communicating well. Once a student has obtained knowledge of the facts (grammar) and developed the skills necessary to arrange those facts into organized arguments (logic), the student develops the skill of effectively communicating those arguments to others (rhetoric). Classical education in the rhetoric stage teaches students to think and articulate concepts to others. Each subject has its own rhetoric, and writing papers, researching, and orating are skills required in all subjects. What is the Classical Trivium?